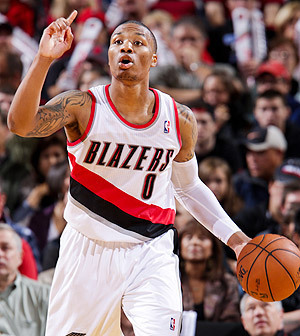 As many expected through much of the season, Damian Lillard was named the 2012-2013 NBA Rookie of the Year earlier today. Lillard who averaged 19.0 ppg, 6.5 apg, and 38.6 mpg in 82 games started (all of which ranked first among rookies for this season) helped the Portland Trail Blazers to a 33-49 record. Even though the Blazers failed to make the playoffs, they increased their win total from last season by five victories. After a very strong Summer League performance, Lillard became this year’s front-runner for the honor after his very first game in the league; in Portland’s season opening 116-106 victory over the Los Angeles Lakers, Lillard recorded 23 points and a game-high 11 assists. Lillard was also 8 of 8 from the free-throw line. From that impressive first showing and win, Lillard had a stranglehold on the award race and never let up. Lillard swept the Kia Rookie of the Month honors for the Western Conference for the entire season, only one of eight rookies to ever achieve the feat. His worst season -statistically speaking -was January, when he only averaged 17.5 points per game. At the same time, though, Lillard had one of his better passing months, where he averaged 6.8 assists per game. While some claimed that Lillard had his shortcomings on the defensive end, it was his ability to help the offense run both effectively and efficiently that helped him (and the Trail Blazers) succeed as much as they did; while Lillard was on the court, Portland averaged 105 points per 100 possessions, as opposed to the 93.5 points per possession they averaged while Lillard was on the bench. Regardless of the Trail Blazers’ shortcomings as a team this year that kept them from the postseason, Lillard’s rookie campaign will be far from overlooked. With such a successful first year under his belt, many Portland fans are looking forward to the future and what-could-be, as both Lillard and Meyers Leonard have continued to build off an impressive young core that the Trail Blazers have worked to build over the past few seasons. And if this season was any indication of his future in the league, Lillard’s Rookie of the Year Award will only be a stepping stone on his path to greatness. You can read the official press release here. For continued coverage of the NBA’s rookies, keep visiting NBA Rookie Class. Also, stay tuned as we begin to look towards the next year of rookies and the 2013 NBA Draft! Don’t forget to look us up on Facebook and follow us on Twitter! This entry was posted in Home, Rookie Recap and tagged 2012-2013 NBA Rookie of the Year, basketball, Damian Lillard, Kia Rookie of the Month, Los Angeles Lakers, NBA, NBA Rookie Class, NBA rookies, NBA Summer League, Portland Trail Blazers, Rookie of the Year, Western Conference by NBA Rookie Class. Bookmark the permalink.